Goodwill of San Francisco has launched what it’s calling the world’s first tech-enabled textile-recycling bin. Designed to make donating clothes, shoes, household linens, and other textiles as easy and convenient as dropping a bottle in a recycling bin, the “GoBin” will offer apartment dwellers a way to drop off their castoffs without leaving their buildings. Goodwill, in collaboration with Frog Design, developed the GoBin with a grant from the San Francisco Department of the Environment, which has pledged to recycle, compost, or otherwise reuse all of the city’s waste by 2020. Each GoBin features a Quick Response (QR) code that enables would-be donors to access an online donation tax form, as well as learn about how their largesse is creating local jobs through Goodwill. To help keep the receptacle tidy, a sensor inside the bin pings Goodwill for pickup before it reaches capacity. 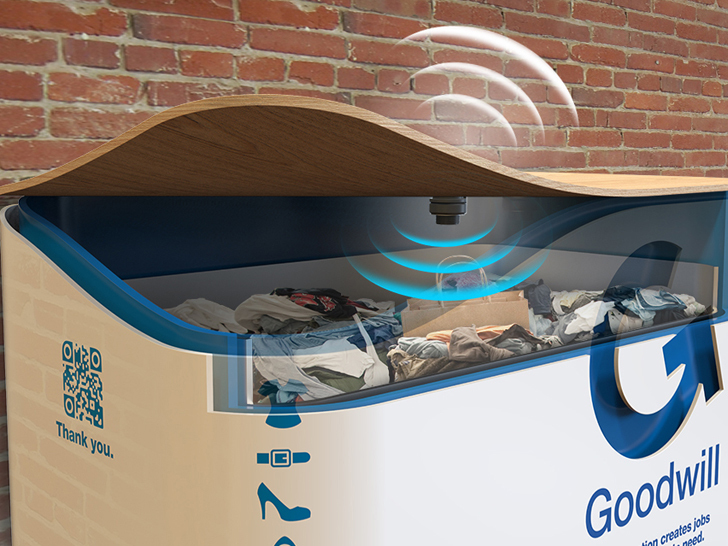 To help keep the receptacle tidy, a sensor inside the bin pings Goodwill for pickup before it reaches capacity. In addition, an internal rolling cart system allows Goodwill drivers to empty a single bin in under five minutes. Goodwill, which has partnered with San Francisco’s building-owner trade association, plans to place GoBins in select high-rise towers this year, with an initial focus on buildings of 100 units or more. The nonprofit is currently accepting preorders for the free GoBins, which it intends to manufacture locally using recycled materials, from local building managers. Following a pilot phase, Goodwill may roll out the program to other chapters across the United States. 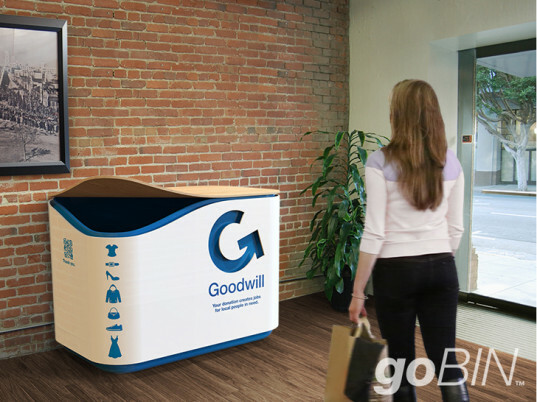 Goodwill is currently accepting preorders for the free GoBins, which it intends to manufacture locally using recycled materials. The sale of donated goods pays for more than 80 percent of Goodwill’s job-training, job-placement, and employment partnerships, according to Sedonaen. Funneling these textiles through the local loop of Goodwill, rather than allowing for-profit companies to “whisk them away” for overseas sale, serves to maintain jobs and payroll taxes at a grassroots level. Goodwill of San Francisco has launched what it's calling the world's first tech-enabled textile-recycling bin. Designed to make donating clothes, shoes, household linens, and other textiles as easy and convenient as dropping a bottle in a recycling bin, the "GoBin" will offer apartment dwellers a way to drop off their castoffs without leaving their buildings. 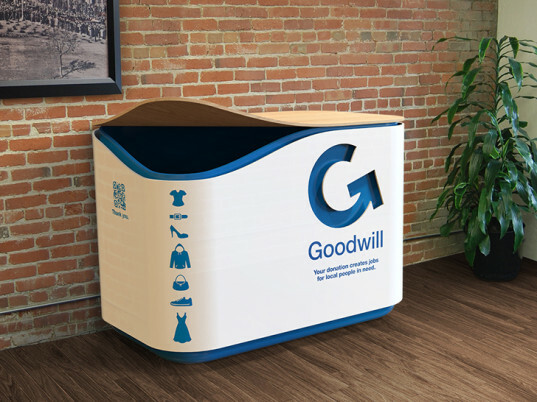 Goodwill, in collaboration with Frog Design, developed the GoBin with a grant from the San Francisco Department of the Environment, which has pledged to recycle, compost, or otherwise reuse all of the city's waste by 2020.